I know that I said I would start in on the parasol once I got the July squares done, but time just keeps getting away from me and I’ve had to re-prioritize my projects. If I want to get The Granny Square Project done in time to give it as a Christmas present, I’ve got to go ahead and see if I can finish the squares in the next month here. I’m not sure how long it is going to take me to join them all. I have a couple of small birthday presents that I want to see if I can whip up real quick this week. I’ve also been working on the dress I wanted to make for my daughter. Unfortunately I ran out of yarn and had to order the color online because I can’t find it in the stores and the dress is sitting in the cupboard waiting to be finished. And finally, I’ve got something that I need to crochet for the four of us for my son’s 1 year pictures. I won’t say more than that because it’s going to be a very fun surprise. But I need to get started on that too! In the mean time, I’m afraid the parasol will just have to wait till this winter, likely after little man’s birthday party. I did however, find a pattern that I like for it and I really can’t wait to get started. As a result, here is August’s first square. The pattern can be found here. This is another one I’ve got mixed feelings on. Instead of working the granny clusters in a chain space, it calls for just working them between the previous row’s clusters. That always feels very clumsy and tight to me. There were also some instructions missing in the first round that I had to figure out, and each round starts unnecessarily (to me anyway) in the middle of the corner cluster instead of at the beginning of it. Normally you would slip stitch over to the corner space to start the next round, where as here you’ve often created the corner space by completing an hdc in the top of beginning chain 3/dc. I always hated joining that way, but it’s probably just a personal preference. I had to leave off the last row to stay within my seven inches. 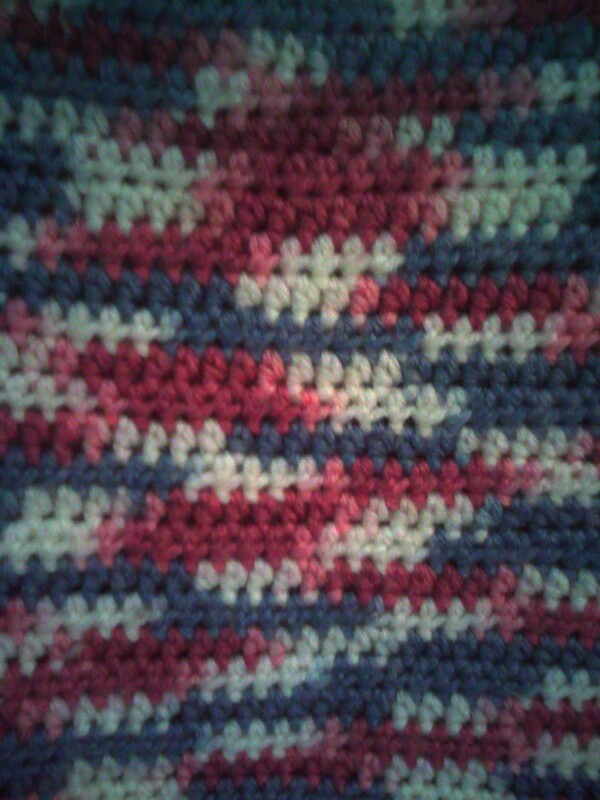 And my last row is worked with half-double crochets instead of dc’s. I don’t really like the rounded off corners and I think I might go back and change that. It would probably fit better with the rest of the squares anyway. But this one also has the front post stitches that I love again to give the 3-d appearance of red ribbon behind the black frame. I really like how that looks. I have to actually buy some yarn for the next square I have planned because I don’t have the color I need. I need some dark burnt orange and that’s not a color I typically work with. I do believe this will be the first yarn I’ve bought for this project. I really like this square. It turned out very pretty. The 3-d effect is accomplished by working behind every other petal on the flower, and then picking the tip of the flower back up after a few rows to anchor it. I got the pattern for this square here. If you look at the pictures on Ravelry, you can see how much you can change the look of this pattern by changing not only the colors, but the progression of color changes and even what rows you change the colors on. I did not follow the pattern’s instruction on when to change colors and I really like how it came out. Also, the pattern is for nine-inch and twelve-inch squares. It provides additional rows for the twelve-inch. Since I only needed seven inches I used a smaller hook. 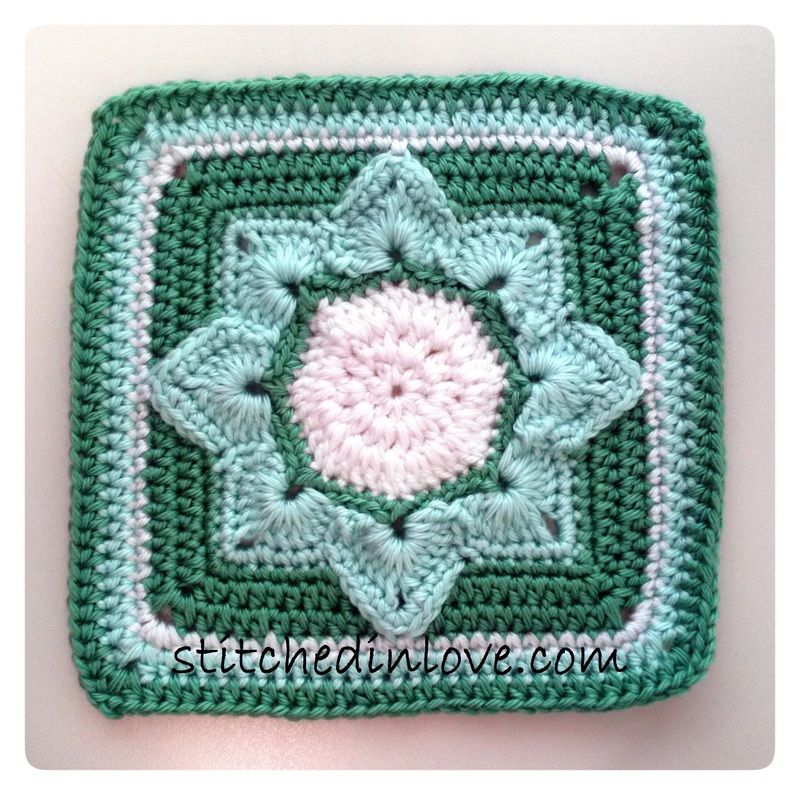 I completed the rounds for a nine-inch square and still needed a little more width. I did not really like what the pattern called for so I just completed two more rounds of half-double crochets. That reminds me of another note on this square. After the flower is completed, rounds are stitched in half-double crochets. Hdcs are not my favorite stitch. The rhythm of making the stitch just doesn’t flow quite as well as a double-crochet for me. That being said, I really like the look of the hdc rows instead of double-crochets. January’s second square is a bit more complicated. 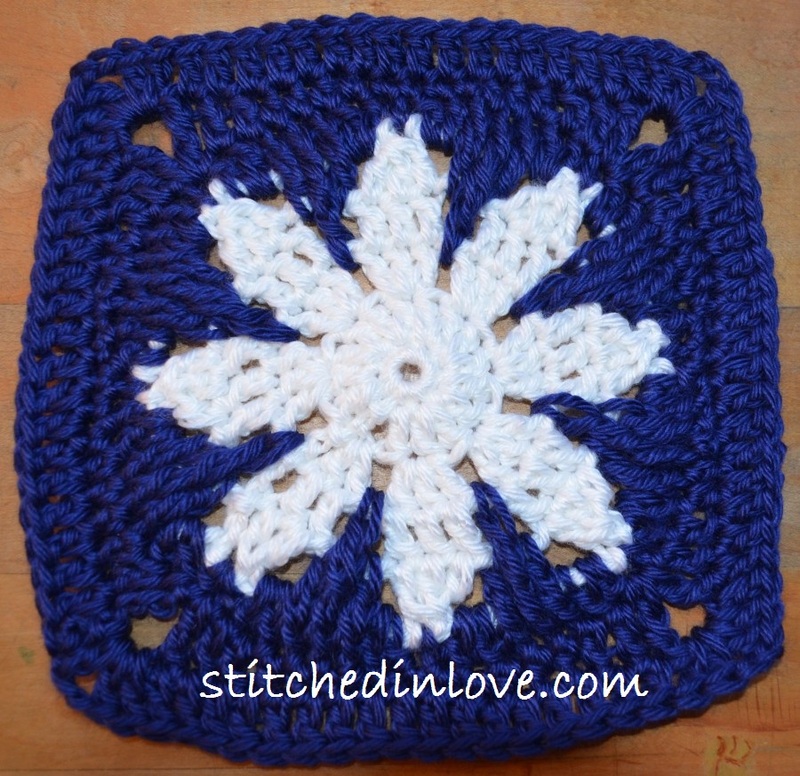 I continued with the cold winter blue and white and added a snowflake. This pattern requires a bit of knowledge in shaping in order to transform the piece from round as it starts out, to square by the last round. 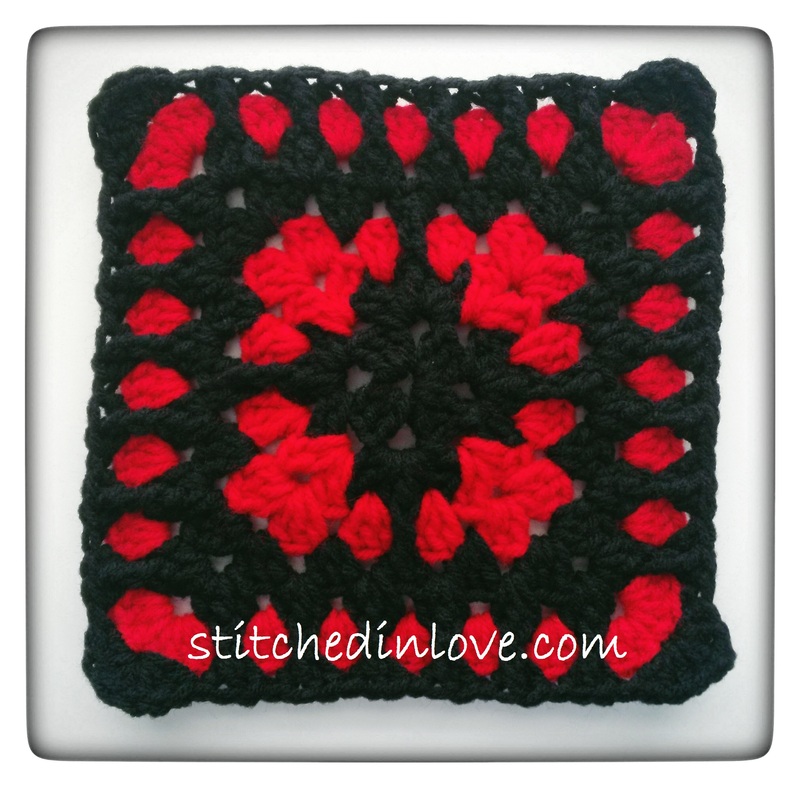 The FREE pattern for this square can be found here on Ravelry. The original picture there is in red and white and the center is done in the contrasting color rather than making the inside all the same color. But it looked like a snowflake to me so I did the center all in white. Just another example of the different results you can get by changing colors. I also skipped the last round of single crochets on this one as I had already reached my seven inches by the round of double crochets. I do like how this one turned out. The snowflake is very pretty. I didn’t find the pattern to be completely clear though. I had to do a bit of experimenting to figure out the shaping. But it all turned out well in the end. So I am a little behind in starting out the Granny Square Project. The new baby decided to come a few weeks early in December rather than wait till the middle of January so I’ve been a bit busy. But, we went to visit the in-laws this past weekend and I was able to get caught up while they played with the kids. So I will be posting both January and February’s squares here shortly. January’s first Granny Square is the most basic of Grannies. 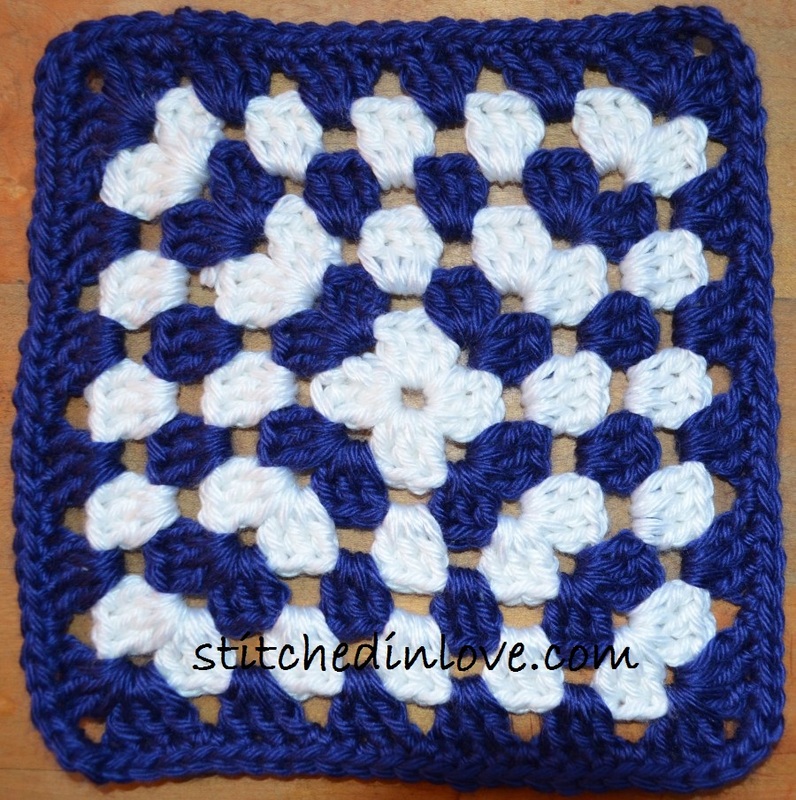 I completed it in blue and white to go with all the cold temperatures and snow we’ve been having this winter. Each of the squares in the project will be seven inches square. The basic pattern is as follows. As a note for all my Grannies, I start them all out using the “magic ring.” There is a good tutorial here if you need it. Round 1: Sl st in a magic ring, ch 3, 2 dc in ring, ch 2, (3 dc, ch 2 in ring) 3 times, join with sl st in top ch of beg ch 3, pull tail of magic ring tight to close ring to complete round. Finish off. Round 2: Join new color with sl st in any ch 2 sp, ch 3, 2 dc in same sp, ch 1, (3 dc, ch 2, 3 dc in next ch 2 sp, ch 1) 3 times, join with sl st in top of beg ch 3. Finish off. Round 3: Join new color with sl st in any corner ch 2 sp, ch 3, 2 dc in same sp, ch 2, 3 dc in same sp, ch 1, (3 dc in next ch 1 sp, ch 1) across to corner, *(3 dc, ch 2, 3 dc) in corner ch 2 sp, ch 1, (3 dc in next ch 1 sp, ch 1) across to corner, repeat from * around and join with sl st in top of beg ch 3. Finish off. Repeat round 3 until the desired size is reached. I also added a row of single crochet for edging with 3 sc being completed in each corner. This is completely optional. The nice thing about this is you can finish off on each round and add a new color, or you can continue in the same color. Each square can look completely different, yet be completed from the same pattern. You can also make it as large or as small as small as you like. Usually the fewest rows completed is 3. (See, I’m trying to appreciate the Granny here.) January’s square two coming up shortly! You can use this pattern for so many different things. You can connect them to make a scarf by single crocheting along the edging, or you can use the join-as-you-go method to create an afghan! I was looking for a star motif pattern and just could not find anything that I liked, so I did it myself. Gauge: Not critical, but you can increase or decrease the hook size if you want a larger or smaller star. This one measures about 7 inches from the tip of the left arm to the tip of the right arm. Round 1: With first color, ch 5, join with sl st in first ch to form a loop, ch 1, 25 sc in loop, join with sl st to first sc. Round 2: Ch 1, sc in same st, hdc in next sc, [dc, ch1, dc] in next sc, hdc in next sc, sc in next sc, * sc in next sc, hdc in next sc, [dc, ch 1, dc] in next sc, hdc in next sc, sc in next sc, repeat from* three times more, join with sl st to first sc, finish off. Round 3: Join next color with sc in first hdc of any section, hdc in next st, [2dc, ch2, 2 dc] in ch 1 sp, hdc in next st, sc in next st, skip next 2 sc, * sc in next st, hdc in next st [2 dc, ch 2, 2 dc] in ch 1 sp, hdc in next st, sc in next st, skip next 2 sc, repeat from * 3 times more, join with sl st to first sc. Round 4: Sl st in next st, ch1, sc in same st, hdc in each of next 2 sts, [2 dc, ch 2, 2 dc] in next ch 2 sp, hdc in each of next 2 sts, sc in next st, skip next 2 sts, * sc in next st, hdc in each of next 2 sts [2 dc, ch 2, 2 dc] in next ch 2 sp, hdc in each of next 2 sts, sc in next sc, skip next 2 sts, repeat from * 3 times more, finish off. Round 5: Join next color with sc in second st of any section, hdc in each of next 3 sts, [2 dc, ch 2, 2 dc] in next ch 2 sp, hdc in each of next 3 sts, sc in next st, skip next 2 sts, *sc in next st, hdc in each of next 3 sts, [2 dc, ch 2, 2 dc] in next ch 2 sp, hdc in each of next 3 sts, sc in next st, skip next 2 sts, repeat from * 3 times more, join with sl st to first sc. Round 6: Sl st in next st, ch 2, dc in each of next 4 sts, [2 dc, ch 2, 2 dc] in next ch 2 sp, dc in each of next 4 sts, hdc in next st, skip next 2 sts, *hdc in next st, dc in next 4 sts, [2 dc, ch 2, 2 dc] in next ch 2 sp, dc in each of next 4 sts, hdc in next st, skip next 2 sts, repeat from * 3 times more, join with sl st to first ch 2, finish off. I started this afghan when I was somewhere around 13 or 14 years old, just after I had first learned how to crochet. I guess you could say it was the first design I ever made. I’d decided to make an afghan and just did row after row of half-double crochets with a variegated Red Heart yarn named Wedgewood. I love variegated yarns. I love the crazy patterns they end up making. So many times I am surprised at what comes out and I never could have planned it to come out better. I have some other pieces I’ll post shortly that demonstrate this even better. 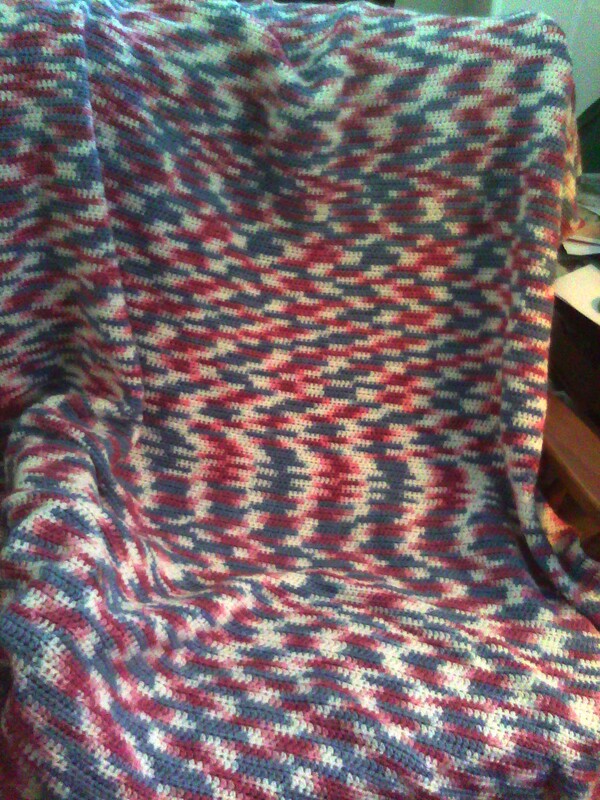 So, I worked on this afghan off and on over the years. It started as a way to explore crocheting further and I soon went on to working from patterns and started making all the gifts I came to love to give. But every once in a while I would pull this back out and work on it some more. The row after row of half-double crochets was pretty dull to work on, but the patterns that developed as I worked and changed skeins helped. The hDc stitch makes a very warm blanket too. I finally finished it just a couple of years ago. It’s just a simple blanket for under the comforter on the bed. You can see the fading at the top of the picture from the yarn I started with 15 years ago, and the difference from the more recent yarn. I don’t feel it’s gift quality, but that’s ok because I really just made it for myself anyway. For me it represents getting past the initial stages of doubt as I learned how to crochet and moving on to having the confidence in myself to be able to crochet anything I set my mind to. Not to mention, it has been the longest running, unfinished project I’ve ever had.